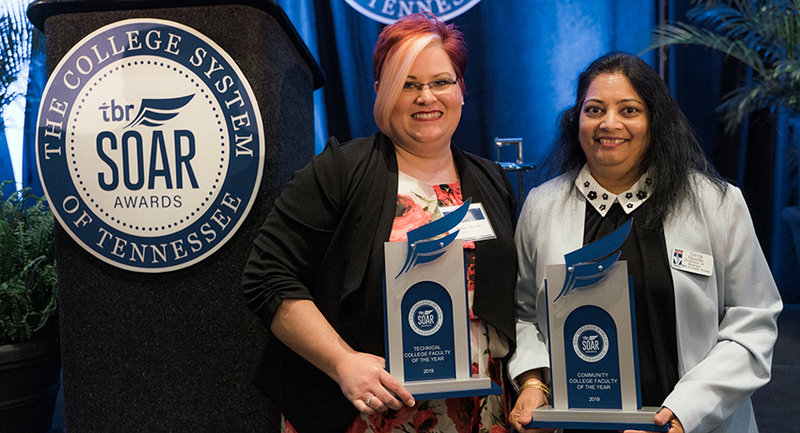 Volunteer State Community College professor, Girija Shinde, was named Community College Faculty Member of the Year at the Statewide Outstanding Achievement Recognition (SOAR) celebration in Nashville recently. Professor Shinde has been teaching Biology at Vol State at Livingston since 2002. The SOAR Awards are designed to highlight student, faculty, and staff achievement in the Tennessee Board of Regents (TBR) system. “The mission of our College System and each of our community and technical colleges is the success of all our students and the development of Tennessee’s workforce. It’s appropriate that we recognize the outstanding students – and the outstanding faculty and staff members on our campuses who work with students daily to help them succeed,” said TBR Chancellor Flora W. Tydings. Eighteen finalists for the individual awards advanced through college- and regional-level competitions in East, Middle and West Tennessee to the final interviews with a panel of judges. One winner was announced in each the three categories for the Community Colleges and for the Tennessee Colleges of Applied Technology (TCATs) – for a total of six individual award winners. Pictured: TCAT Faculty Member of the Year, Rebecca Russell of Knoxville; and Vol State professor, Girija Shinde, Community College Faculty Member of the Year.